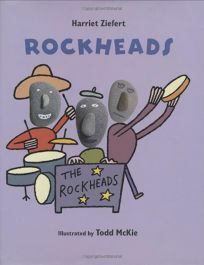 From the team behind Squarehead comes Rockheads by Harriet Ziefert, illus. by Todd McKie, a rhyming counting book featuring a cast of friends that expands to 12 (""Our cheerleading squad totals ten./ Can you guess which kid is Jen?""). Their heads, which perch upon flat, childlike illustrations drawn with heavy black outlines, are photographed rocks, with simple features painted in black and white.